RTO+P is hands down one of the most interesting agencies I’ve ever come across. From their décor to their creative-first attitude, they certainly stand out from the pack. But did you know they also have one of the most unique positions you’ll see on a business card? Enter Steve Thompson, aka “The Maker”. Is he an artist? A tinkerer? A mad scientist? I’d argue he fits into all three categories. You see, Steve’s role is to build just about everything and anything the agency might need. Whether that’s an in-lobby spectacle to woo potential clients or a commemorative piece of art to welcome a new hire, Steve is the man behind it all. 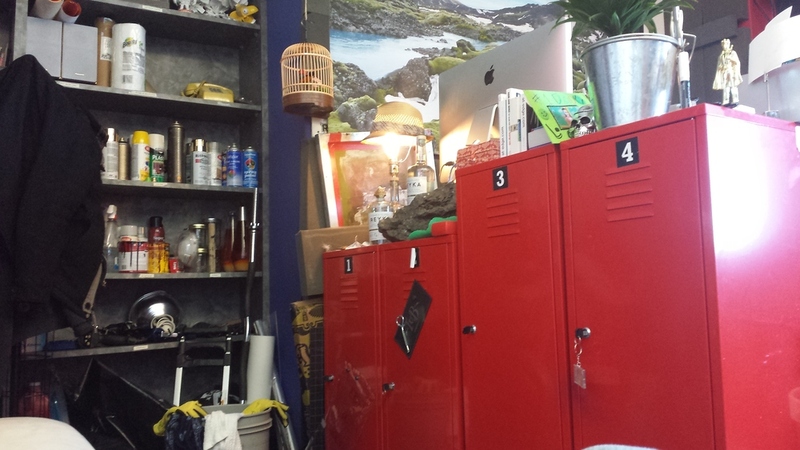 Located a few steps west of the beer tap, his office looks more like an art room than an office space. It’s littered with cans of spray paint, jars of mysterious substances and a scattering of random objects—from rubber gloves and gas containers to pipe cleaners and floodlights. Even when he’s not in the office toiling away, you can instantly feel his buzzing energy just by looking through the doorway. Many years ago, Steve started in the more familiar role of Art Director at RTO+P. During that time, he found himself taking on the role of in-house builder, because a lot of clients needed items produced on rather small budgets. As time wore on, that role become more and more predominant, until it became a full-time job of its own. Eventually, the partners discussed the idea of making it official and before you know it, the role of “Maker” was born. The rest, as they say, is history. So where does Steve find his inspiration? “I’m lucky enough to be surrounded by a lot of talented and inspiring people here at RTO+P,” he said, “And at the risk of sounding cliché, my two daughters are a constant inspiration because of how creative they are with everything they encounter.” For individual projects, Steve digs deep into the essence of the brand, so his creations can embody its true voice and personality. He also references sites such as thisiscolossal.com as sources of daily inspiration. Whether it’s a shot glass lantern for Icelandic Vodka brand, Reyka, or a trophy for Dial for Men’s “Muckdown” competition, Steve crafts works of art you won’t find anywhere else. Sure, “Maker” isn’t a job title you’ll come across in many agencies, but it’s a role Steve truly feels at home with. You can tell he’s passionate about what he does and it shows in the quality of his creations. His journey is a powerful reminder to always be yourself because you never know where it might lead you.